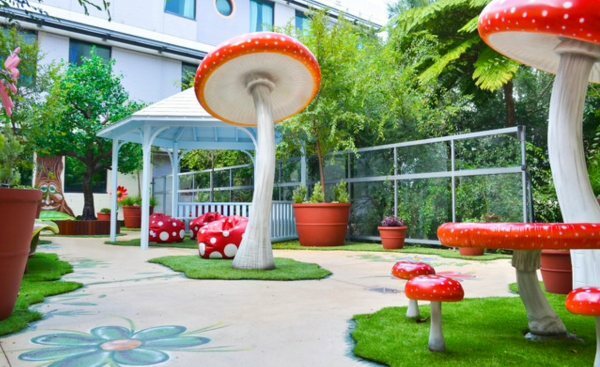 Fairy Garden or Miniature Garden - What's the Difference? Last month My Little Fairy Garden attended the WAMA Dollhouse Miniature, Doll and Bear Show at Cannington Exhibition Centre. It was wonderful to be surrounded by many traditional miniature enthusiasts who were willing to share their knowledge and experience with us while we were able to share some magic and whimsy with them. During conversations it became apparent that there is some confusion on the difference between a fairy garden and a miniature garden. So, what is the difference? Strictly speaking, these are all about uniform scale - not just scale of the accessories, but of the mini trees, plants and hardscape too - all shrunk down to miniature size. The idea is that if you were to look at a section of the miniature garden in a photo you couldn't easily tell if you were looking at a miniature or full sized garden. All the elements of the garden are in proportion to each other. When creating a fairy garden we are creating a space for the little fairies that are living in the world around us. The combination of human sized plants and fairy sized pieces co-existing together is where the magic happens. The accessories used in fairy gardens are usually not replica of 'human world' pieces but rather inspired by nature, like wooden tree stump seating and acorn teacups or whimsical pieces with bright colours and quirky detailing like yellow spotty watering cans or butterfly stepping stones. Sometimes the pieces within the fairy garden are in proportion with each other, sometimes they aren't - a uniform scale is not so important as fairy gardening is about enchantment rather than perfection. There are no rules when it comes to the plants used. 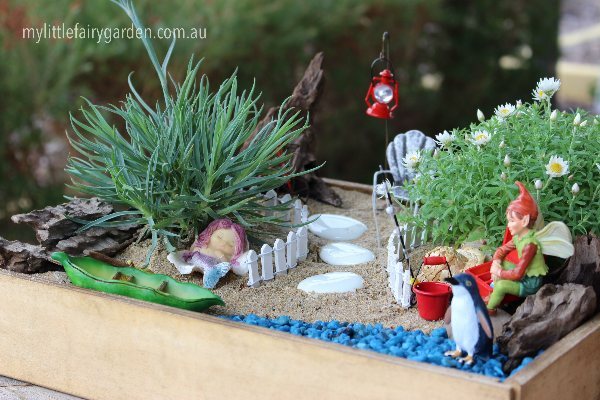 Whilst compact plants work well in a container or terrarium garden, a fairy garden is equally as magical hidden amongst the larger lavenders or daisies in a backyard garden or under a large tree with little windows and a door attached. You'll often hear these gardens refered to as 'miniature fairy gardens.' - The insertion of the word 'miniature' simply sets it apart from life-sized fairy gardens which are created for child/human play within. What do we mean when we talk about scale in miniature and fairy gardening? Scale is the relation between the real size of something compared to the/it's miniature replica. The most widely used 1:12 scale means 1 inch in miniature is 12 inches or 1 foot in life size. For example, if we have a 19 inch cottage we calcualte 12 x 19 which comes to 228 inches or 19 feet in real life. Most doors are around 7.5 feet high, so if the mini door is 7.5 inches then the scale is 1:12. If the cottage was just 9.5 inch and the mini door was 3.75 inches, it would be 1:24 scale. It is important to note that our fairy garden miniatures are not made to fit a specific scale and will often vary throughout our different ranges. If scale of your accessories matters to you we recommend checking the dimensions of the pieces (in the product description tabs) to ensure they will complement each other and your miniature display. View our photo galleries for more inspiration. 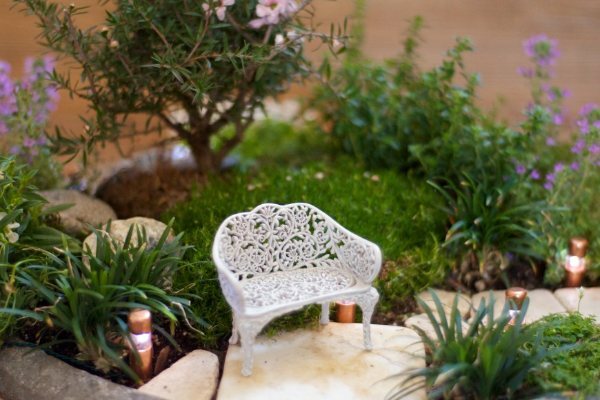 Whether you choose to create a fairy garden or a miniature garden, you will be able to find a large range of wonderful miniature accessories to suit your project in our online store.